Thursday August 31st was the school-wide Raider Pride Community Kick-Off Day at Twin Valley Middle School. 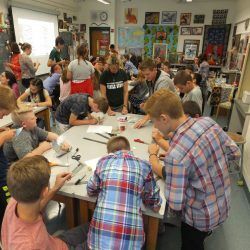 Middle School teachers and staff hosted team building activities, a goal setting station, an inspiration center, a school art project, problem solving stations, a Technology Talk, and Class Meetings with the Principals. This day was being set aside to honor the importance of building Raider Pride and Community among all students and staff. The events of the day were designed to be fun, engaging, and an educational opportunity to strengthen the TVMS culture. Check out the coverage on the TVSD Facebook Page, the TVMS website, and at our Twitter link (@tvmsraiders). The Middle School Advocacy program, called Raider Pride, has been in existence since 2010. It was created by concerned staff, students, and parents in order to build relationships within our school, reduce bullying and other negative peer interactions, and enhance the learning environment for all students. Raider Pride has undergone several enhancements and refinements over the past 7 years in order to make it more meaningful and effective for each grade level of our students. Our current model includes a strong student-centered approach with 8th grade and other trained student leaders participating as peer group leaders. This approach is designed to give students more voice and control in their own culture and environment.